On March 1st of this year (2018) I published a blog about Video Conferencing to enable effective digital collaboration. This blog was all about breaking down the physical distance between geographically spread teams to enable them to communicate with each other. The blog referenced to the wide spread availability of software solutions that support the collaboration of individuals and teams. The availability of all these software solutions however introduce a new challenge. In this modern time it is almost required to have multiple different software solutions to support us in doing our job. This ranges from word processors and email clients to chatting tools and even more. For software development teams a whole suite of tools is added relating to issue tracking, version control, build & release management, requirements management and many more. These software development related tools often offer collaboration features within the tools. For example the Atlassian tool Jira for issue tracking, sprint planning, sprint execution, release tracking and portfolio management offers the functionality to mention other users in comments (for example) or to share Stories, Epics, Improvements with other users to start a content discussion. The challenge that arises is that multiple end-point solutions for issue tracking, version control and content collaboration have their specific features for digital collaboration. There is no central place where the real collaboration takes place. In the last blog (https://tmcalm.nl/blog/videoconferencing-to-enable-effective-digital-collaboration/) about digital collaboration I referenced a solution for Video Conferencing. Another important software solution for digital collaboration is a chatting application. 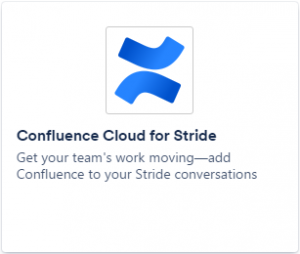 offered by Atlassian called Stride (as a cloud offering) and HipChat (as the on-premise offering). Both applications offer the option to chat with colleagues on a 1-to-1 basis (including video chat) and they offer the ability to create chat rooms to have a group chat on a specific topic. Bides the name of a room it is possible to have a clear identification of the topic for discussion relating to a room. This means that a chat in such a room becomes an in-context chat. For example the screenshot that is shown above references a Stride room called Data Center. The main topic of this room is the Data Center products offered by Atlassian. If a chat entry does not relate to this topic, it shouldn’t be posted in this room. The real value offered by Stride (and also Hipchat) is the ability to integrate other applications. Per chat room apps can be added and configured. A number of out-of-the-box apps are already available for example for Confluence, Jira and Bitbucket. With this setup, instead of having multiple end-point solutions that each offer digital collaboration related features, a fully integrated central hub for a development team is created. Everything that happens in the different applications (in this example Confluence, Jira and Bitbucket) can be posted in a chat room. So besides having multiple team members chatting together about a specific product development related events that occur within Confluence, Jira and Bitbucket are also posted in the same room. This results in a full in-context chat with all relevant information available. Besides integrating Atlassian applications it is possible to integrate 3rd party applications. Some of the integration enable creating ,for example, a Go2Meeting entry to have a virtual meeting with customers (who don’t have access to the company internal collaboration solution). Another example. 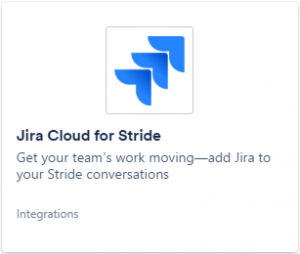 When a high prio defect is registered in Jira (by a test team or a customer service team), Jira could automatically post this event in the respective Stride chat room. All team members that are in that room see this event and can start an in-context / issue related discussion to resolve the defect. When pull-request related information is also posted in the same chat room all the team member see an in-context flow of postings all related to the resolution of the high prio defect. 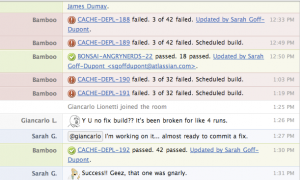 The integration even enables for creating issues in Jira from within the chat room. When Jira is mentioned (@Jira) the string ‘create’ is interpreted as a command to create a new issue (in this case the integration has ‘Story’ configured as the default when no specific type is specified). And the text following create is used as summary for the new to create Story. After the new story is created Jira publishes this event in the same Stride room. This is the confirmation of the new created Story. Integrating for example the build automation enginee (Bamboo or even a 3rd party solution) enables for a central location where status changes from Jira, pull request reviewing progress from Bitbucket and build status information from Bamboo is combined with the chat messages from the engineers regarding the progress of release a component, sub-system or full product depending on the scope identified for the specific chat room. The combination of all the end point solutions publishing their events in the same room where the developers chat with each others makes that the developers have only one context to start their daily work and identify the most important tasks to start first. From this central collaboration hub the developers switch to the different integrated applications to either update cards on a (Jira) sprint backlog (if not automated by Bitbucket), approve pull requests in Bitbucket or analyse the details of a failed build in Bamboo. With this blog I hoped to inform you about the possibilities of using a team chatting application like Stride or HipChat to enable for a centralized collaboration hub. Switching to end point solutions is still required but done only after analyzing the actual state of affairs from the central captured information in a specific collaborative chat room. An often heard argument against a solution like Stride or HipChat is We already have Skype for Business, we don’t need a chatting solution. 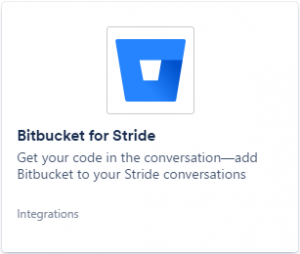 What people do not see is that Stride or HipChat offer a context and topic driven chatting solution with the ability to integrate dev-tools. This not possible to achieve without significant customization using Skype for Business. If you are interested and want to learn more about digital collaboration and / or team chat and / or application integration to enable a centralized collaboration hub feel free to contact me. Contact detail are on our website (https://www.tmcalm.nl/).